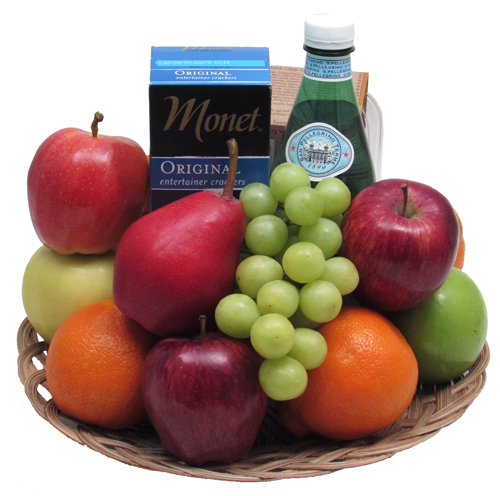 Our classic fruit basket is great for any occasion. Midrib Coco basket filled with a selection of seasonal Fruit, carefully chosen and beautifully presented! Also includes bottle of S.Pellegrino Sparkling Water, box of Crackers, box of Cheese Straws/or Cookies, Cheese, and Nuts. Wrapped in crisp clear cellophane and topped off with a big beautiful handmade bow. We can also wrap in a Happy Birthday print in primary colors as well. Just let us know in the Special Instructions section when placing your order. Includes a handwritten greeting card. Wrapped for local hand delivery approx. 12" in diameter x 10"w.
NOTE: FOR LOCAL DALLAS AREA HAND DELIVERY ONLY. No fruit baskets during December or on Valentine's Day.